Wabbajack is a unique legendary Neutral support card. It is part of the Core Set. 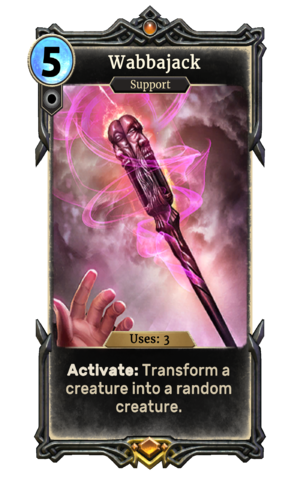 The Wabbajack is the artifact of the Daedric Prince Sheogorath. Wabbajack was formerly of the Intelligence attribute, but this was changed during the closed beta period. This page was last modified on 11 December 2018, at 00:06.